Founded in the early 2000s as a taskforce with a budget of just $100 million, the agency now called the Joint Improvised-Threat Defeat Office, JIDO, has evolved over the years. First, it mushroomed into the Joint Improvised Explosive Device Defeat Organization, JIEDDO, with a multibillion-dollar budget and a three-part mission that had it inventing counter-IED technology while simultaneously collecting intelligence and training troops on what to look out for. Then it shrank in a series of reorganizations that eventually housed it under the Defense Threat Reduction Agency. its director Lt. Gen. Michael Shields says. he told reporters last week at a demonstration day the office hosted. As small quadcopters and fixed-wing drones became cheaper and more accessible over the last few years, the Islamic State put them to use on the battlefield — for everything from conducting surveillance to dropping small bombs. The natural extension of that was their use of the drones. I don’t see that going away. Thomas told a special operations forces conference in May. At one point, there were 12 ‘killer bees,’ if you will, right overhead and underneath our air superiority. Though nowhere near as life-threatening to U.S. troops as the IED has been in the 15 years of war in Iraq and Afghanistan, the problem jump-started JIDO’s rapid response arm. The office rushed two devices into theater in fewer than 60 days, and has been part of the U.S. military’s all-hands-on-deck response since. ISIS isn’t using drones to the same great effect they were at the start of the year, the deputy commander of the U.S.-led war in Iraq and Syria told Defense One last month. But JIDO is still building new tech to fight the armed drones, because officials say that just like with the other forms of IEDs — vehicle-borne, roadside bombs, booby-trapped buildings, and the like — ISIS will continue to innovate its tactics as the Pentagon pushes out new solutions. said Lisa Swan, JIDO’s deputy director for mission support. We adapt, they adapt, we adapt, they adapt…sometimes we put things out there and it isn’t a long-term need because they have adapted and so we must move on to the next thing. It’s the IED problem all over again, just airborne. And groups like ISIS are further advantaged by the drone industry itself, which JIDO scientist Hatch Tynes said is constantly innovating to make drones not just more capable, but also “idiot-proof” — easier to pilot and more resilient. There’s no equivalent commercial market driving innovation on the counter side. One approach JIDO is exploring, in conjunction with the Air Force Research Lab, is getting spoofing equipment aloft on a fixed-wing unmanned vehicle. The idea, scientists from both organizations said at JIDO’s field day, is to marry the ground-based Negation of Improvised Non-State Joint Aerial threats (NINJA) that electronically takes command of the drone, with a surveillance drone called the Long-Endurance Aerial Platform (LEAP). Both technologies already exist and are deployed separately in Central Command. In short, they want to fight drones with drones. There’s still work to be done — miniaturizing the NINJA system to give the mated system a longer endurance, figuring out how best to use it with troops on the ground and the like. JIDO said it plans to demo the integrated platform next spring. But it’s far from the only approach to realizing a battle of the drones. 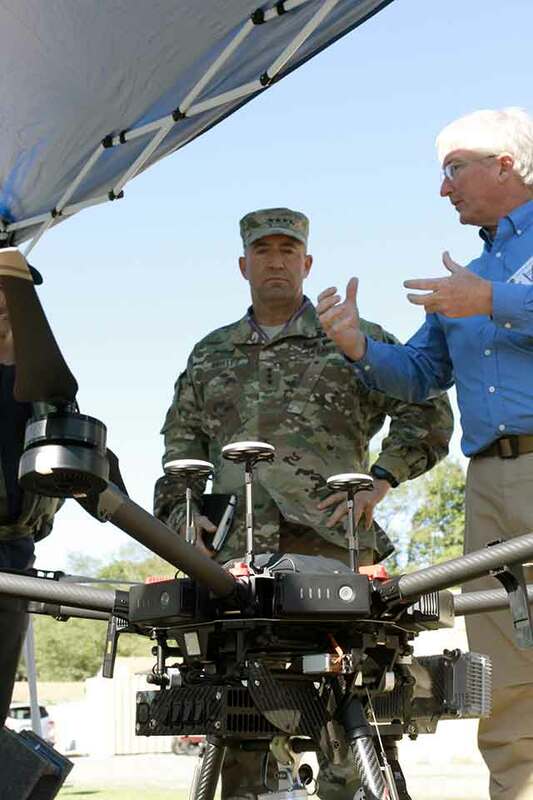 Another experimental platform JIDO had on display was a hard-kill option attached to the military’s own commercial drone — a DJI M600. 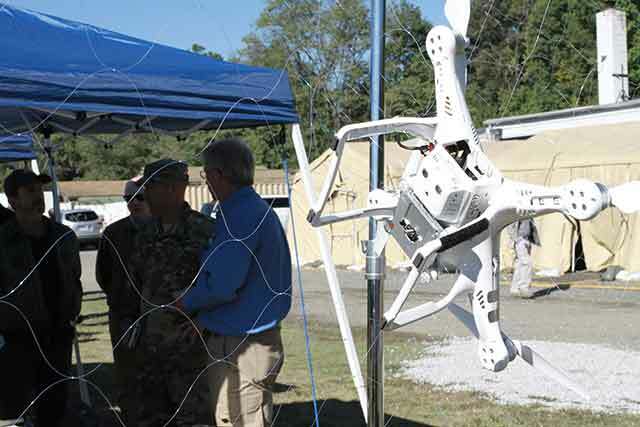 Unlike the “soft kill” NINJA/LEAP combination which electronically disables the drone but leaves its mechanics untouched, this technology would give troops the option to physically stop a drone by ensnaring it in a net. While previous devices have launched nets at enemy UAVs with mixed results, a copter drone displayed by JIDO and the Air Force Research Lab last week can sweep the air with an attached net, a promising approach both against single UAVs and the expected swarms of the future. But before U.S. troops and partner forces can take down an enemy drone, they first have to be aware of it. Commercial drones are hard to hear, harder to spot, and not metallic enough to be picked up by radar. So JIDO’s looking at various sensors and detection systems, including things that pick out enemy UAVs by their acoustic signatures. But “the trick is always the noise,” Tynes said. The U.S-led coalition may have ousted ISIS from its physical capitals in Raqqa and Mosul, but the threat it and other extremist organizations pose will continue. Chairman of the Joint Chiefs Gen. Joseph Dunford said yesterday he believes ISIS will attempt to establish a physical presence outside Syria and Iraq and, barring that, will continue to link up with local insurgencies — as the Pentagon believes it did in Niger, where four U.S. soldiers were recently killed in an ambush by an ISIS-affiliated group. And without a defined caliphate, will ISIS probably rely more on traditional insurgent tactics, like low-effort, asymmetric drone attacks? “The answer is yes,” Shields said. And they likely won’t be the only ones doing so.